On this page, we explain concepts, practical limitations, and stream-specific configuration parameters of Flink’s relational APIs on streaming data. Despite these differences, processing streams with relational queries and SQL is not impossible. Advanced relational database systems offer a feature called Materialized Views. A materialized view is defined as a SQL query, just like a regular virtual view. In contrast to a virtual view, a materialized view caches the result of the query such that the query does not need to be evaluated when the view is accessed. A common challenge for caching is to prevent a cache from serving outdated results. A materialized view becomes outdated when the base tables of its definition query are modified. Eager View Maintenance is a technique to update materialized views and updates a materialized view as soon as its base tables are updated. A materialized view is defined as a SQL query. In order to update the view, the query is continuously processes the changelog streams of the view’s base relations. With these points in mind, we introduce Flink’s concept of Dynamic Tables in the next section. Dynamic tables are the core concept of Flink’s Table API and SQL support for streaming data. In contrast to the static tables that represent batch data, dynamic table are changing over time. They can be queried like static batch tables. Querying a dynamic table yields a Continuous Query. A continuous query never terminates and produces a dynamic table as result. The query continuously updates its (dynamic) result table to reflect the changes on its input (dynamic) table. Essentially, a continuous query on a dynamic table is very similar to the definition query of a materialized view. The second query is similar to the first one but groups the clicks table in addition to the user attribute also on an hourly tumbling window before it counts the number of URLs (time-based computations such as windows are based on special time attributes, which are discussed below.). Again, the figure shows the input and output at different points in time to visualize the changing nature of dynamic tables. 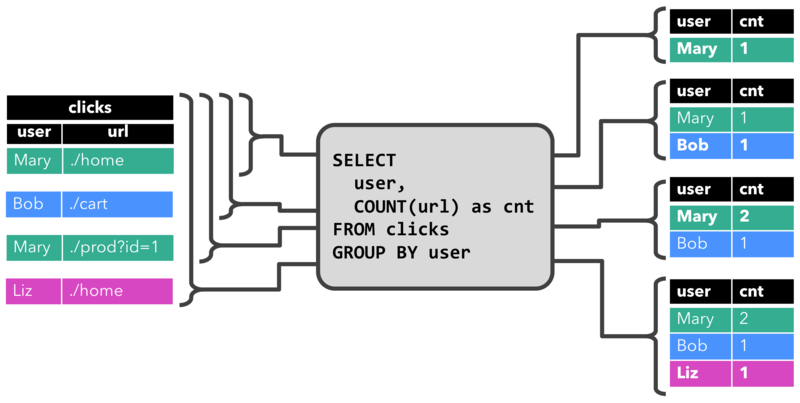 The QueryConfig section discusses parameters to control the execution of continuous queries. Some parameters can be used to trade the size of maintained state for result accuracy. Upsert stream: An upsert stream is a stream with two types of messages, upsert messages and delete message. A dynamic table that is converted into an upsert stream requires a (possibly composite) unique key. A dynamic table with unique key is converted into a dynamic table by encoding INSERT and UPDATE changes as upsert message and DELETE changes as delete message. The stream consuming operator needs to be aware of the unique key attribute in order to apply messages correctly. The main difference to a retract stream is that UPDATE changes are encoded with a single message and hence more efficient. The following figure visualizes the conversion of a dynamic table into an upsert stream. Time attributes can be part of every table schema. They are defined when creating a table from a DataStream or are pre-defined when using a TableSource. Once a time attribute has been defined at the beginning, it can be referenced as a field and can used in time-based operations. The event time attribute is defined by a TableSource that implements the DefinedRowtimeAttribute interface. The getRowtimeAttribute() method returns the name of an existing field that carries the event time attribute of the table and is of type LONG or TIMESTAMP. Moreover, the DataStream returned by the getDataStream() method must have watermarks assigned that are aligned with the defined time attribute. Please note that the timestamps of the DataStream (the ones which are assigned by a TimestampAssigner) are ignored. Only the values of the TableSource’s rowtime attribute are relevant. Configuring different minimum and maximum idle state retention times is more efficient because it reduces the internal book-keeping of a query for when to remove state.